Liberal MPs choose Bob Rae as their interim leader in a decision Wednesday confirmed by the party executive. 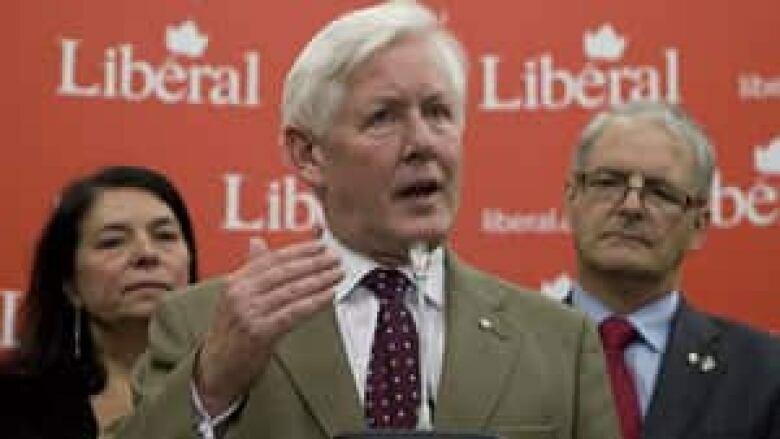 Bob Rae, chosen as the federal Liberal interim leader Wednesday, says his party has a bright future and needs to rebuild to again become "a movement for change." Rae was picked over Marc Garneau to fill the void left by Michael Ignatieff's resignation as Liberal leader the day after the May 2 election that dropped the Liberals down to only 34 seats and third party status in the House of Commons. The Liberal caucus of MPs and senators held a meeting Wednesday morning where Rae was elected and the choice was quickly confirmed by the party's executive board, which had final say over the interim leadership. The Toronto MP and former Ontario premier said he was honoured to accept the position. "I'm looking forward very much to our work in the House as well as our work in the wider country," Rae said at a news conference in Ottawa after the caucus meeting. Rae said the party has a lot of work ahead of it but that the Liberals are feeling a strong sense of solidarity and commitment. "We simply have to, if I can coin a phrase, pick ourselves up, dust ourselves off and start all over again," he said. Following the historic election defeat that cost the Liberals their Official Opposition status, questions about the Liberal party's future were quickly raised. The Conservatives' plan to phase out the per-vote subsidy for political parties will particularly hurt the Liberals, at a time when they are overhauling how they operate. Canadians sent Liberals a "tough message"
Rae dismissed any doubts that the Liberal party will survive. "We have a great history as a party and I believe we have a great future," he said. "I have no hesitation in saying that the Liberal party is here to stay. We're here to fight for the things that Canadians believe in." Liberals have to convince Canadians that they will fight for their values and beliefs, he said, because Canadians will give money to causes they believe in, said Rae. Host Evan Solomon talks with Ian Capstick, Geoff Norquay and Tim Murhpy about Bob Rae, Sheila Fraser and the announcement by Jim Flaherty that he'll phase out the per-vote party subsidy when he "reintroduces" his budget June 6. Listen to the Power & Politics War Room podcast. "That means our party has to become, which it has always been at its best, a bit of a movement, a movement for change, a movement for progress, a movement for things that we believe in," he said. Rae said Canadians sent Liberals a "tough message" in the spring election. "It's a message that we have received and we have understood," Rae said. "We know that we have a lot of rebuilding to do, we know that we have a lot of work to do." Newly-appointed interim Liberal leader Bob Rae speaks to the media in Ottawa on Wednesday as his wife Arlene Perly Rae and MP Marc Garneau look on. (Adrian Wyld/Canadian Press)Garneau, a Montreal MP, was the only other caucus member who had publicly expressed interest in the job, and he was standing by Rae's side Wednesday. Rae thanked Garneau for his support, saying he acted with integrity throughout the "conversation" the Liberal caucus had while choosing the temporary leader. Rae was considered the front-runner with wide support among the 34 remaining Liberal MPs and 45 Liberal senators, but Garneau had kept his name in the hat. "We took a very important first step today, a critical first step. We elected a great leader," Garneau said after Rae spoke. He said he felt "very serene" about the whole process and was "looking forward to the next steps." Ahead of the meeting, Garneau said he was going for the job because he loved the party and felt he had the qualities needed to help rebuild it. He did not rule out trying for the more permanent job of leader if he lost his bid for the temporary position. "That's something that I might consider but at the moment that's not my intention," said Garneau, a former astronaut and head of Canada's space agency. Garneau said he didn't view Wednesday's selection of an interim leader as a race between himself and Rae. "We all move together, unified, after the selection is made," he said. The national board of the Liberal Party set ground rules for the interim leadership, which limited the number of candidates. Those interested in the job had to be bilingual and agree not to run as permanent leader or to pursue any merger talks with the NDP. Rae, who had made it clear he only wanted to be interim leader if it lasts longer than a "summer job," said he accepts the conditions and had also given his word to his wife that he's only taking the interim job. Rae first ran for the Liberal leadership in 2006, losing to Stéphane Dion, and was also set to take over from him in 2008, but stepped aside so Ignatieff could take the job uncontested. Rae said Wednesday he would have liked to become Liberal leader earlier, but is happy to have the responsibility now. "I accept the fact that it's come at this point and in this circumstance," he said. According to the party's constitution, Ignatieff's permanent replacement must be chosen by October. Many Liberals, however, want a leadership convention to be put off until at least 2012. On June 18, the party will hold a mini-convention via teleconference where a proposal to change the constitution will be voted upon so a permanent leadership contest can be delayed. The new Liberal leader said his party will spend the summer listening to Canadians and party members, and he promised it wouldn't be an "empty exercise." Rae said that engagement would be key in rebuilding the party and so will the policy convention scheduled for January 2012. NDP Leader Jack Layton told reporters at a noon news conference that he wished Rae well "as leader of his party on this interim basis. "We of course have our work to do and we'll be focused very much on that," Layton said.